BOOM! 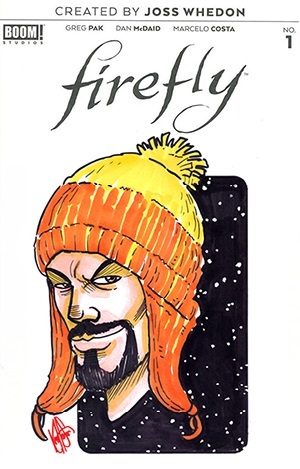 Studios, along with visionary writer and director Joss Whedon (Buffy the Vampire Slayer, The Avengers), presents an all-new era of the pop culture phenomenon Firefly, as one of the most demanded stories in the franchise's history is revealed for the first time! Captain Malcolm "Mal" Reynolds, a defeated soldier who opposed the unification of the planets by the totalitarian governed Alliance, will undertake any job-legal or not-to stay afloat and keep his crew fed. Find out now how his story began as BOOM! Studios delves into Mal's past, how he met his first mate Zoe and the real truth about the War of Unification, the intergalactic Civil War that divided friend and family alike. Focusing on family, loyalty, identity, and the price of redemption, writer Greg Pak (Mech Cadet Yu, Totally Awesome Hulk) and artist Dan McDaid (Judge Dredd: Mega City Zero) take you back to the battleground where Mal's journey began.